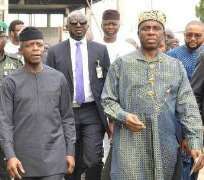 New details are now emerging regarding Vice President Yemi Osinbajo’s battle over the weekend to stop the Transport Minister Rotimi Amaechi and the planned arraignment of Chief Justice Onnoghen before the Code of Conduct Tribunal. Per Second News in an exclusive report revealed that President Buhari was not in the know of the action to try the CJN. The VP’s position, according to sources, is that the Tribunal option is not in line with due legal process. While Amaechi had been scheming to have the matter hurriedly handled before the Tribunal, when the Vice President got wind of the matter, he posited that due process must be clearly and transparently adhered to. A source noted that strong claims were existing implicating the CJN on several fronts, including breach of extant laws bordering on corruption and conspiracies. This was the basis of the need to prosecute the CJN. But the VP denounced the plan to arraign the CJN before the Tribunal immediately he got wind of it, insisting that due process had to be followed strictly, especially in dealing with such an important personality in the judiciary. According to the sources, the VP specifically warned against the arraignment at the Code of Conduct Tribunal and the current manner in which the case is being pursued. “While he acknowledged the strong case against the CJN, the VP firmly noted that there should be a diligent approach that is in line with due process. He did not agree at all to the way the matter is now being managed,” said an informed source. And when it seemed that an overall consensus had emerged, the Minister went behind and drafted a few security officials into the plot to arraign the CJN at the Tribunal. In executing the plot, the Minister had gathered a small group, including some senior officials of security and investigative agencies and approached the Code of Conduct Bureau and Tribunal with a petition authored by a “renegade” former official of the CPC, Dennis Aghanya, who on the last count was known to have taken both the CPC and the President to court challenging his removal from office as a national official and the legality of the then CPC Exco. Even, the Attorney General of the Federation Abubakar Malami was kept in the dark until very late in the day regarding the arraignment at the Tribunal sources disclosed. It is believed that the FG is now finding means to properly handle the matter going forward. Speaking with this newspaper on Saturday a senior administration official familiar with the mattersaid ” It was the minister’s thing. It was his idea. His way of working ahead to resolve his state’s issue in his group’s favor. He knows the case will get to Supreme Court. He is not in good terms with the CJN.